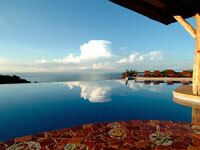 Hotel Punta Islita is like nothing else in Costa Rica! This eco-friendly beachfront property is the only hotel in the country to include an exciting menu of complimentary eco-adventures and cultural experiences to make your stay more engaging and fun. The resort also has an executive 9-hole golf course featuring hybrid turf and planet-friendly irrigation, a lovely spa, and two pools—both with swim-up bars. This is a stunning location on a lush hillside overlooking Costa Rica's Pacific coastline, with a curving black sand beach a few hundred feet below. Hotel Punta Islita is the winner of many travel related awards including Fodor's Choice and 2018 Trip Advisor Travelers Choice. The advanced level seminar is taught by some of Michigan's finest family law attorneys. The seminar fee of $250 includes one excursion. A companion excursion is $150. Seminar fee is waived for speakers. Package will be reserved for you upon receipt of a $2,500 non-refundable deposit on or before July 23, 2018. Balance is due by October 15, 2018. Since this is a package price, room and air will not be sold separately. TRAVEL INSURANCE is strongly recommended to cover trip cancellation and interruption. Travel insurance may be obtained through Travel Guard or Allianz. This trip often sells out. Reservations will be accepted on first-come, first-served basis if reservations exceed accommodation limits.